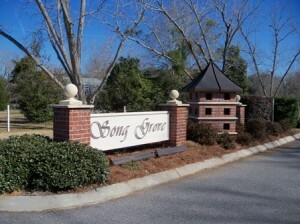 Song Grove is small subdivision tucked away on lazy Booth Road in Fairhope, AL. The subdivision has a very nice entrance, that leads to flawlessly designed custom homes set among grand oak trees and thick, natural vegetation. You will find many of new subdivisions in Fairhope being developed from retired farm land or pecan orchards, thus, lush landscapes, like that of Song Grove, become all the more desirable. In addition to the peaceful, natural surroundings, Song Grove also has an incredibly convenient location. The subdivision is just a few short minutes from Fairhope schools, Thomas Hospital, drug stores, grocery shopping and our quaint downtown. If you are looking for newer custom quality homes, with an off the beaten path location, then I would definitely recommend that Song Grove be given consideration. Call 251-866-6464 to tour Song Grove Subdivision Fairhope AL with the Jason Will Real Estate Team.